Several cinder cones, including Big Craters, along with the Pioneer Mountains, are visible from the top of Big Cinder Butte (Craters of the Moon, Idaho). Young lava flows at Craters of the Moon National Monument, Idaho. NASA Earth Observatory image by Robert Simmon, based on Landsat data from the USGS Global Visualization Viewer. This Pāhoehoe lava flow at Craters of the Moon in Idaho resembles those found following volcanic eruptions in Hawaii. Yellowstone Caldera Chronicles is a weekly column written by scientists and collaborators of the Yellowstone Volcano Observatory. This week's contribution is from from Zach Lifton, geologist with the Idaho Geological Survey. Idaho is home to several young volcanoes, including the Craters of the Moon, Wapi, Kings Bowl, North and South Robbers, Cerro Grande, Hell's Half Acre and Shoshone lava field. Craters of the Moon is one of the youngest volcanic areas in Idaho and may be the most likely in the state to erupt again. Over the past 15,000 years, eruptions at Craters of the Moon have occurred about every 3,000 years, and so the next eruption might be expected sometime in the next 1,000 years. Besides its fascinating geologic history, Craters of the Moon is also a unique landscape that is recognized as a National Monument. Archaeological evidence suggests that Shoshone indigenous people visited the Craters of the Moon area as early as 12,000 years ago. It is therefore likely that the Shoshone witnessed some of the eruptions at Craters of the Moon, the most recent of which ended about 2,100 years ago. The area was noted as a unique landscape by western explorers in the mid-1800s. In his 1837 biographical book "The Adventures of Captain Bonneville," Washington Irving described the area in less-than-glowing terms: "… nothing meets the eye but a desolate and awful waste … and where nothing is to be seen but lava." However, others recognized the beauty and scientific value of the area, and in 1924 it was formalized as a National Monument. Craters of the Moon is made of more than 60 lava flows that erupted between 15,000 and 2,100 years ago. The lava field covers more than 600 square miles. Eight different eruption episodes are known, and each episode lasted hundreds to perhaps thousands of years. An interesting feature of Craters of the Moon is that about the same volume of lava was erupted during each episode, therefore it is considered to be "volume-predictable." Volcanologists therefore expect the next eruption to produce 1-1.5 square miles of lava. 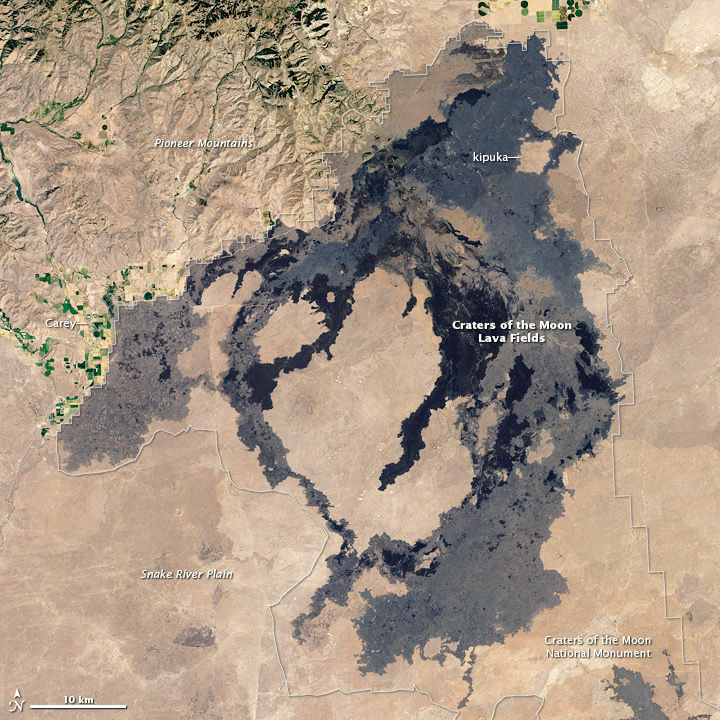 Volcanic eruptions at Craters of the Moon occur along fissures in the NW-SE trending Great Rift volcanic rift zone, which is aligned parallel to active faults adjacent to the Snake River Plain. 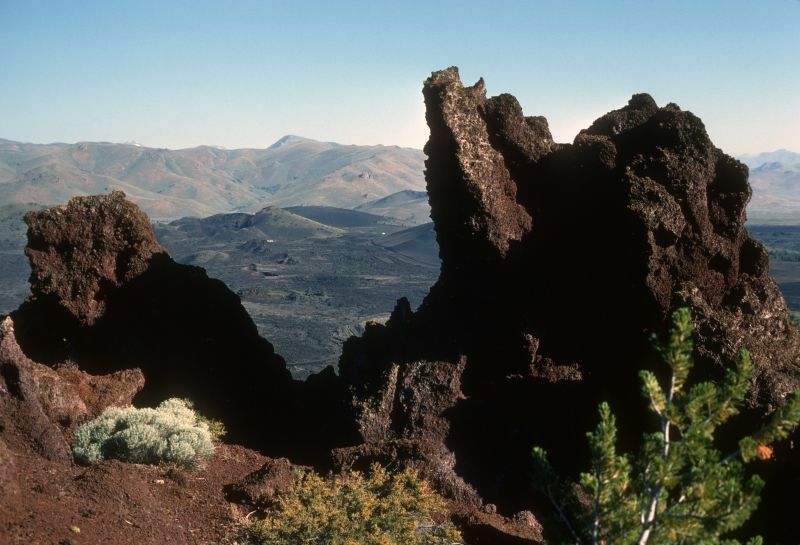 Because of their young age, the volcanic rocks at Craters of the Moon preserve many volcanic features, including domes, cinder cones, shields, and lava flows with characteristic structures (like pahoehoe ropes), lava tubes, spatter ramparts and pressure ridges. The fissure eruptions at Craters of the Moon were probably very similar to modern fissure eruptions at Kīlauea Volcano in Hawaii, which exhibit the same features. Studying eruptions at Kīlauea may therefore help scientists and emergency managers understand what to expect the next time Craters of the Moon erupts. The primary hazard of future eruptions of Craters of the Moon will most likely be slow-moving lava flows that can travel as far as 20 miles from their source. While the populated communities of Carey and Arco are not expected to be directly affected by the next eruption, the lava flows can threaten rangeland and farms. Eruptions may also impact transportation: U.S. Highways 20, 26, and 93 pass through or near the volcanic area. While Craters of the Moon will almost certainly erupt again (perhaps within the next 1,000 years), it is not considered a high-risk volcano. Earlier this year the U.S. Geological Survey published their 2018 update to the National Volcanic Threat Assessment, which is an effort to prioritize research, monitoring and mitigation at volcanoes in the U.S. The threat assessment categorizes volcanoes as very low, low, moderate, high and very high threats. Four volcanoes in Idaho are listed in the threat assessment, all of them described as "low" threat: Craters of the Moon, Hell's Half Acre, Black Butte Crater and Wapi Flow. Nevertheless, we remain vigilant to the volcanic threat in Idaho, with regional monitoring stations well established to warn of any potential future activity.